Long ago, parrots were admired not only for their colorful feathers of green and bright blue, scarlet and yellow, but also for always telling the truth. A parrot perched in the corner of a store or house was the best guardian a person could wish for, a tiny observer who truthfully reported what he saw or heard. People learned not to stretch the truth with parrots around! They also learned to not ask questions when they didn’t want to hear truthful answers. The mayor asked villagers what they thought of his daughter’s singing. “Like a nightingale,” they politely replied, even though they thought the girl sounded like a duck. All eyes turned towards the parrot. “Quack. Quack,” came from the perch in the corner. That night, before the moon rose, Tevra draped the parrot’s cage with black cloth. He took water from his cistern and climbing a ladder, sprinkled it on his tin roof, making it sound like rain. When he pounded the roof, it sounded like thunder. The next morning the villagers arrived early to hear Tevra’s proof. “Did the moon rise last night?” Tevra asked the parrot. “And the weather was clear,” said Tevra. All the villagers were willing to believe parrots lied, much happier with lies than the parrots’ truth. Only Eduardo’s mother doubted that her son had really eaten his lima beans, knowing that feeding them to the puppy was much more likely. The parrots were dismayed by how easily their service to mankind was dismissed. Flying into the jungle to consult with each other, they met a wise mynah bird. For centuries, mynah birds could speak, but only repeated what people said. 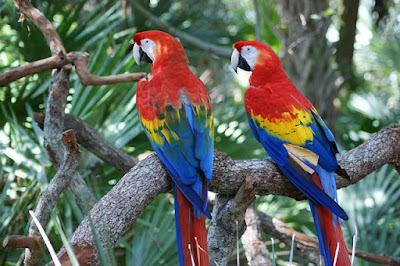 And, from that day on, parrots only echoed what they heard and everyone was satisfied.